'GREENOCK ROAD' is a self-penned 14 track CD from this seasoned musician, whose influences range from Gram Parsons to Willie Nelson.This is more than a music release, this is a musical journey - a chronicle of living and working in the beautiful but gritty West Coast of Scotland. Hailing from the former shipbuilding town of Greenock, Scotland, the title track is a homage to his roots. 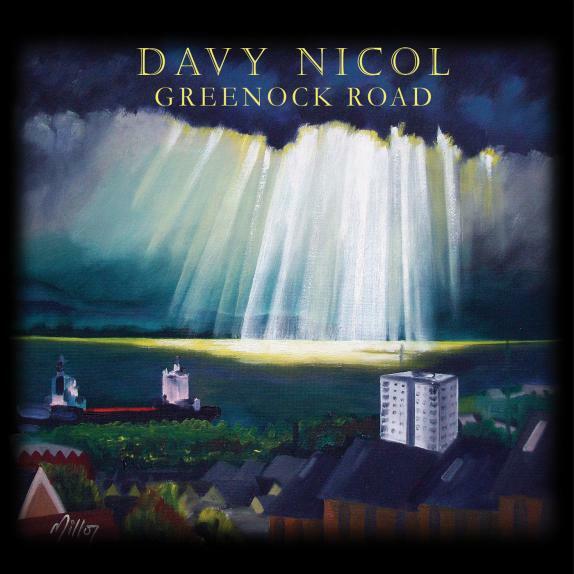 Kicking off the album the track 'New Light' showcases Davy's fearless stripped back vocals on the intro, subsequently punching in with electric guitar from Stephen Power. The infinitely beautiful 'Farewell my Love' features atmospheric fiddle from Alison McNeill. It's a haunting lament of depth and passion and these qualities can be heard throughout all 14 tracks. This is a collaborative release with a pool of local talented vocalists and musicians, showcasing a variety of skills using bodhran, pipes, harmonica and mandolin. This array of musicianship adds a richness of production to this release. Lead vocal on 'Running on Home to You' is the talented singer Arlene Casimiro. This upbeat duet is reminiscent of Courtyard Hounds 'See you in Spring' featuring Jakob Dylan. Crisp clear vocals and pin sharp harmony. Standout track on the album is 'Six Numbers on a Ticket'. Delivered in his native dialect, this honest lottery wining track is a winner in my book and I'd put money on it any day.